On July 6th, 2014, Richard Lester’s rock n’ roll musical comedy, A Hard Day’s Night, starring The Beatles turned 50 years old. On July 7th, 2014, Ringo Starr turned 74. Today, I saw A Hard Day’s Night digitally restored on the big screen. I have been a huge fan of The Beatles since I was 8 years old, and they still remain to be one of my favorite bands, and in my humble opinion, one of the five best bands in the history of music. I have seen the surreal and whimsical, Yellow Submarine. I have seen the silly yet entertaining, Help! Yet I had never seen The Beatles first and most beloved film, A Hard Day’s Night. If you have never seen the film even if you are a Beatles fan, this will be an interesting experience. If you are not a Beatles fan, you might even enjoy it. If I were to tell you this movie was silly, hyperactive, and lacking in the plot department, you would probably not want to see it. What if I told you that these were some of the reasons why you should WANT to see A Hard Day’s Night? Much like the band, this movie is absolutely fab. The acting, the music, the plot (or lack thereof), the humor, and the cinematography are so just so well done. So for the 50th anniversary of A Hard Day’s Night, here are a few reasons why this movie deserves to be a classic. What is Good about This Movie? This movie is hilarious! Honest to god, this is one of the absolute funniest movies to come out of the 60’s. The humor is the absolute best part of this film. Even without the Beatles, this movie would still be funny. What is remarkable about the humor is that the gags and jokes are delivered almost perfectly. Some of the sight gags are kind of dated by today’s standards, but are still very funny because they are used so well. But for the most part, the humor does not feel dated at all. In fact, I would find it hard to believe that Edgar Wright did not use this movie as a reference. Much of the film’s dialogue is of the Edgar Wright vein of quick and cheeky humor. An example of this is in a scene when the band is being interviewed and a reporter asks Ringo, “Are you a mod or a rocker?” and he replies, “I’m a mocker.” In the same scene, another reporter asks George, “What do you call that haircut you are wearing?” and George responds, “Arthur.” There are several clever lines like that throughout the movie. A lot of the humor is quite self-referential which is odd considering this movie was made in the 60’s when humor was much, much more literal. One such scene that exemplifies this is when during a recording section, the band randomly leaves the studio and starts joyously jumping, running, and fooling around outside on a track field. When this montage is over, a groundskeeper comes over and says something along the lines of, “This is private property! How did you get here?” prompting the boys run away. All of the characters are very funny. Wilfrid Brambell especially gets a lot of laughs as Paul’s trouble-making grandfather. Another thing that surprised me about the film was the satirical portrayal of studio workers and music producers. For a movie that is largely supposed to be a big commercial for The Beatles; I love that the writer got away with some satire. The main thing that keeps this movie’s humor running is how it never stops for a minute. The whole movie is one big joke, and it is damn funny one. Now I referenced how this movie has no real plot. That’s not entirely true. The film follows a loose plot. But the lack of useless plot lines makes this movie so much freer. Basically, the movie follows The Beatles while they are touring and the hijinks that occur between doing television appearances, escaping paparazzi, and other side-plots like the toiling of Paul’s grandfather. The camera work is really what makes this lack of plot so enjoyable. The camera never stops moving! As the band runs, the shaky camera runs along with them. If the band is performing, it will get a shot of them from every angle. I have never seen camera work quite like it before and probably never will. The chaos of the plot is matched perfectly with the camera. The material is so good, and the tone is so joyous that you won’t even care about story structure, and I think that is exactly what the movie is going for. A lot of people might call this sloppy and may be put off by the movie, but I could dig it and hopefully so will you. The black and white, documentary-type filming style of this movie has showed up a lot in pop culture after this. Many people will be surprised about how much they recognize from their favorite films in this Beatles film. I might be biased because I love the music of The Beatles so much, but the music in this movie is pretty great. Although the dubbing of the pre-recorded music into the footage is pretty terrible, I am willing to let that slip because the film is 50 years old. What is great about the music is the even with the bad dubbing, it is used really well and it is very invigorating. A problem I had with Clint Eastwood’s Jersey Boys was that I thought all of the music in the movie was done very blandly and it did not elicit much joy from me or the audience. I love the Four Seasons too, so that was kind of disturbing. In the theater I saw A Hard Day’s Night in after every song, the audience (including myself) clapped. It was almost as if The Beatles were there with us. 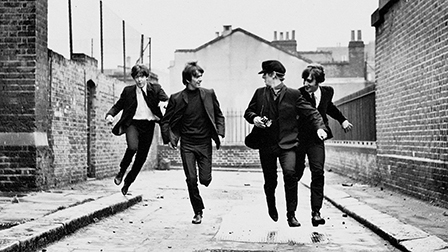 The movie features such famous early Beatles tunes as “A Hard Day’s Night,” “She Loves You,” and “I’m Happy Just To Dance With You.” Besides the music by the Beatles, the score in other scenes by George Martin is surprisingly great as well. I came out of the theater humming “She Loves You,” and it is still stuck in my head now. If that is not a good indication, I don’t know what is. This movie holds up now in an interesting light. It was made in 1964, the beginning of Beatlemania. As Carrie Brownstein put it on Portlandia, they were just “4 lads from Liverpool.” They were not yet the musical stronghold they are now, and at first, they were a sensation that made young girls’ hearts throb. They did not know the band would only last 10 years. They did not know that George Harrison would die. They did not know how many problems the band would have with their success. Nobody yet knew how the band’s success would rub off on John Lennon’s ego, that his image would change so much, that he would be murdered by Mark David Chapman. That is why it is so odd to see John Lennon in a bubble bath playing with a toy submarine and jet plane. The band’s future really does not effect how good this movie is or not; it is just interesting to see this movie 45 years after The Beatles split. John, Paul, George, and Ringo are not the same as their incarnations in the movie, but their onscreen personas are just so likable that you can put the real life people and real-life accuracies aside. Unlike The Partridge Family, which gave television goody-goody vision of the actual Partridge Family, that was ultimately a lie. The Beatles in this movie have so much personality, are so goofy and boyishly charming that you can’t help liking them. Each member gets a lot of screen time, both together and on their own. Being the drummer, Ringo usually is the target of many a joke throughout the film, Ringo is surprisingly in this movie for probably the most amount of time. He gets a very funny plot line where Paul’s grandfather tells him he is wimpy and has not lived life, so he just goes out and tries to live a little in the town where the band is recording. How random is that? Yet for some reason it works. All four of the Beatles are silly, rambunctious, and youthful, but they are not rude or stupid. They are instead charming yet snarky. What is Bad about This Movie? I am an ugly American. I often could not really understand what John, Paul, Ringo, and George were saying because of their English accents, and I think I may have missed a lot of good material because of this. This movie was written with a lot of Liverpool dialect at the request of the band and that may have been too much for my American mind. Nonetheless, I even enjoyed some of what sounded like The Beatles merely grunting at each other just because of their delivery. A Hard Day’s Night was limitedly re-released on July 4th and is playing around the USA now. You can also check it out on Amazon Instant or buy the Criterion Collection release of the film. Previous ArticleTV Review: Beauty and the Beast 2x22 "Deja Vu"